This is what you should get with the large eucalyptus bouquet if you purchase from Hobby Lobby, the regular eucalyptus/far right, silver dollar/center & leaf type/ left side. I have separated it so I know what I have. You will need cut sections of floral wire, about arms length pieces, long enough to work with but not to long to get tangled. 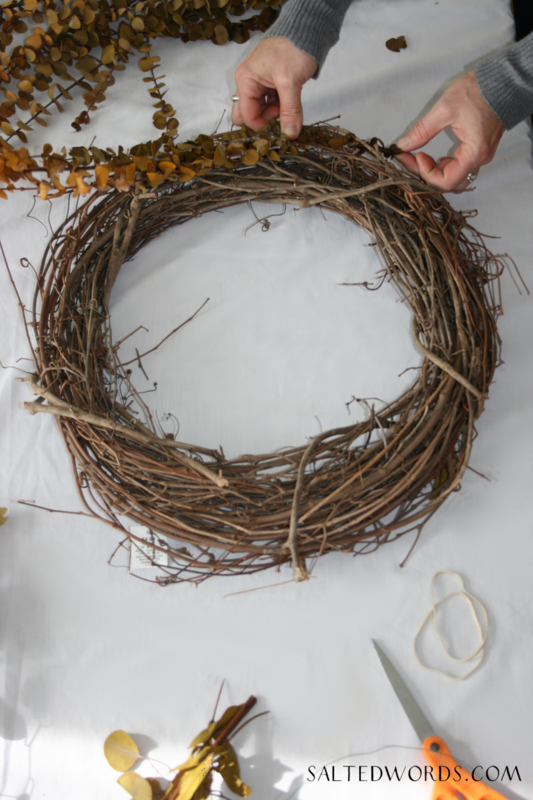 You will start by putting a stem in the grapevine wreath itself to secure it so you can get the wire started, then start the wire by wrapping it a couple of times around the wreath and secure it by twisting a knot in one end leaving a long piece of wire to start wrapping your stems. Now you will just start laying your eucalyptus stems around and wrapping each with the wire, once you get a few times around with your floral wire you will have some help holding your stems in place. With this particular wreath you will leave the tip ends of your stems out so they form the spray look. This is to show you the tips of the stems out, I left out about 5-6 inches because I really like the fuller look but if you would like a thinner looking wreath just wrap your tips up tighter. This is most of it wrapped around, when you get all the way around you may need to trim a little and add some sprigs just so it is even all the way around. So here is our finished wreath, I love it and it smells beauty-Fall! Don't mind our blank signs in the back ground, we're trying to decide what we want in this spot and still have not as of yet, ha! We hope you have enjoyed this tutorial and happy wreath making to you.